At the heart of the film critical impulse lies the question, what is cinema for? This is central, even if not asked directly, even if the work at hand seems to hold no loftier ambitions than the avoidance of its own calamitous end. The act of writing on a particular film always points to an alternate work that might have been, one that exists only in the critic’s mind. Imagining a better or different object than the one at hand automatically introduces thorny questions of ideals and quintessentials, which in turn lead to purposes and absolutes. And if such a thing as a definitive “for” in cinema can be defined, captured in a bottle, then we also get closer to explaining that other underlying question of all art criticism: Why do we (critics) do what we do? Why all this watching and writing? If cinema can be said to be for anything, then let it be to offer up transformative experiences like The New World. Because if critics are to be consigned to post-facto sideline analysis of artistic achievements and failures, let us, once in a while witness an audacious, singular triumph. Terrence Malick’s fourth film is a rarity: an end, an absolute, a work of art that can’t be imagined better. Back at year-end time in 2005, we held the Reverse Shot polls open well into January to give our writers a chance to catch up with Malick’s late-released masterpiece, silently predicting that if enough of the staff saw it, it’d wind up in our top spot. This choice was as much personal as political; at the time, there was urgency around the film—The New World remains an art-film blockbuster directed by one of the medium’s most revered authors, a gift from cinema heaven dropped into our laps. It seems unbelievable now, but The New World wasn’t greatly loved critically. There was no outpouring of mainstream support, the film hardly made a dent in the box office, and it went unnoticed at awards time (that year’s nominees, for the record: Crash, Brokeback Mountain, Capote, Good Night and Good Luck, and Munich). All of Malick’s films have been met with open arms by the faithful, but even some supporters wondered if he’d gone off the storytelling cliff in his trip back to the early days of American colonialism—The Thin Red Line’s hazy panoptic narrative was only a warm-up for The New World. At the time, it seemed a film that might well have been the last of its kind, and Reverse Shot went all-in for it (as did Manohla Dargis, the nascent The House Next Door, and many others). The New World eventually swamped Kings and Queen in our poll, but of course that didn’t stop the film from disappearing relatively quickly from theaters. The New World is simply more than just a movie. Terrence Malick’s fourth film brings mythology to life, narrativizes it, and by trading away facts and dry specificities for immersion and experience, it ends up an ideal historical object. Even though much of the film, imagined as it is (and this reimagining of America is core to Malick’s project), may not be “true,” that doesn’t lessen the essential “truths” of the film. His floating steadicam and purposeful tracking shots are redolent of intellectual and philosophical clarity. There’s no trickery around the image—Malick’s aims at reframing history are genuine. Perhaps more than any other film on this list, The New World reminds us of the poetry inherent in the realistic, unvarnished image, and by extension, the poetry found at the intersection of history and lore. The film literally opens with an invocation (here, to Mother Earth, but it might as well be to cinema), a welcoming invitation into Malick’s gently rigorous ongoing meditation on humanity. The backdrop of the natural has played a role in all of his features this far, but in this telling of our nation’s birth story, of contact between Europeans and natives in the unspoiled New World, he’d found the perfect setting for his major concern: man’s relation to nature. The film opens with an image of Pocahontas from below, her arms lifted like branches to capture energy from the sun. The last shot is from a similar vantage point looking up at massive trees. Where else could he go next but to Darwin’s Tree of Life? Never has a film of this budget been so radically edited. You might find more cuts in any number of recent action abortions, but Malick uses incessant chopping to dizzy us (defying the trend toward longer and longer takes and dead time found in most of world “art” cinema), and he cuts to any damn thing he pleases. As the relationship between the film’s two main characters, John Smith and Pocahontas, grows, we might witness them watching lightning strike a far river bank, then see them basking in the sun in the next shot, then find them in the dark by firelight, all in the span of a few seconds. Shots are repeated throughout, signaling memory and emotions the characters dare not speak. This kind of montage isn’t uncommon when employed at the beginnings of films to establish setting, characters, time, or to quickly move through masses of events later on. Malick uses montage as the basis for his stories. He needs so many shots because he’s bursting to show us things—for every image we see, there’s likely four or five more he wishes he could offer; his editing suggests the immensity of the material (and by extension his grand worldview) that’s not included in something so limiting as a single movie. Montage is also mood in The New World: the film’s not unlike a disassembled panoramic time lapse—we’re dropped into it at the crucial moments of its span. However, Malick knows well that he can’t untether us entirely, the radical discontinuities of the image track are tied tightly together by the recurring, circular score by James Horner (paired with Wagner), which runs on its own internal logic, providing one of the best aural assaults of the decade, a proper companion to perhaps the aughts’ most beautiful film. What other major film of this or any decade casts a real movie star (Colin Farrell) as its lead, and places as his foil a shockingly young actress (the astonishing Q’Orianka Kilcher, seemingly unaffected by the major motion picture being built around her) only to then not have them speak on camera for nearly the film’s first half hour? Malick has always placed emphasis on words by using fewer of them. Instead of presenting characters rattling on banally, he inserts us into their deepest thought wells via voiceover and makes up for the rest with a flood of images. Farrell’s Captain John Smith enters the film via an unassuming close-up: he’s locked in the ship’s brig, the epic landfall is happening around him. Pocahontas (Malick cheekily rejects naming her; later in the film when an Englishwoman tries to utter the legendary moniker out loud, the girl shushes her) is the center of the opening invocation, but the film sidelines her at first in a wondrous swirl of shots. Malick places them as subjects in history, before showing us how their actions join the stream of events and shape its direction. Appropriately enough for a film about contact in its myriad forms, The New World’s heroes, from dissimilar cultures, have to teach each other how to communicate before we’re allowed into their relationship, before we see how their relationship affected history. The two start, appropriately enough, attaching language to elements of nature, then progressing to the parts of the human body, literally, elementally moving from the ground up. They lapse into love rather than fall into it. Smith’s view of the New World is the mythic one, “a land where one might wash one’s soul pure, rise to one’s true stature. A new start a fresh beginning.” But things are both more complex and more simple than that. 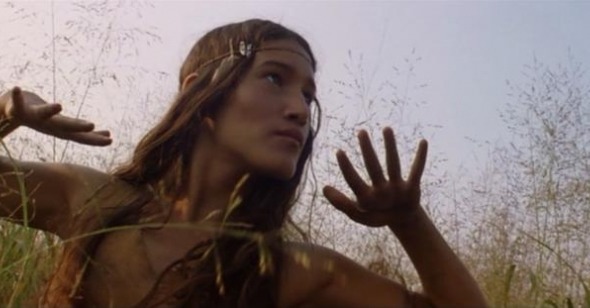 Even though The New World features a view of Native Americans that Howard Zinn would be proud of, its story is not all Edenic; Malick’s idealism is laced with pragmatism. Though the society of the “naturals” is set up as an idyll, one of the first signs of their civilization that Smith finds on his trip upriver to trade is a head on a stake. And though the film’s most wondrous when basking in the haze of lovers’ pleasure, there’s always darkness, the threat of violence. When it eventually strikes, it spares no one. The New World is also valuable for dispensing with the old canard of the native peoples’ one-way interest in European settlers. It’s clear that there’s fascination on both sides. By the time Smith’s lived with the naturals and returned home to find a newly walled-in, fetid Jamestown (his voiceover remarks that it’s like damnation), where people are starving while surrounded by plenty, one might wonder which civilization is more advanced. Smith’s travels upriver and indoctrination into that community (a metaphorical, ceremonial birth) neatly mirror Pocahantas’s late-film emergence into proper British society, the film’s most grandiose touch (in some ways these last twenty minutes are the film’s heart, just like A.I.’s radical-break finale). She’s just as curious about the world of London as the English are of her, and Malick’s slowly oscillating camera offers the closest we can come to actually experiencing wonder through another’s eyes. In his reverse shots he makes connections: Pocahontas passes a black man walking freely, sees a raccoon in a cage. This is her New World, and by bringing the film full circle, Malick generously reminds us that we’re all potential “others” depending on circumstance. We like to think of our masterpieces as complete—the kinds of things you could hang on a wall or put on a pedestal and not touch, safe in the knowledge that the artist “made it that way.” Before the advent of home video, the idea and commercial value of a director’s cut, of cinematic versioning, was largely unheard of outside of studio-director infighting. Malick has taken the idea to an extreme with The New World—there are three different incarnations of this, the best film New Line Cinema ever produced: the original theatrical cut; the recut, shorter theatrical version; and the longest, the director’s cut now available on DVD. I’ve seen all three, and what’s remarkable is how difficult it is to parse the differences. Malick traffics in sense and feel, not narrative, so inclusions or exclusions can only be judged on the degree to which they disrupt or abet the flow of the movie. Each cut has its own rhythm, and all succeed grandly. Malick’s proven himself the consummate digital filmmaker, but not in the sense we’ve come to know the term, with the images it evokes of brash kids waving around toy cameras. His work is version-ready, shave some, add some, no matter. The force of his vision is so strong that I’d watch a nine-hour cut. Hell, I’d live in The New World if I could. It’s a film less watched than bathed in. Americans who truly came of age (that passage from late teens and early twenties into late twenties and early thirties) in these past ten years found a political situation that disabused us of much of what we’d been taught about our America. Malick’s return to the creation of America makes room for the stinking rot at the core of our national mythology (capitalism, imperialism), but also for the transcendence of sacrifice, love, of the beauty and wonder of existing in nature, the flipside, often un-actualized, potentialities of human history. His view may skew towards the pastoral naive, but it’s rendered complexly enough to be transformative. Smith eventually leaves Pocahontas for further exploration and the promise of glory. The bereft girl, exiled from her people, finds tentative union with John Rolfe (Christian Bale), and the film shifts gears to view another, more rational kind of love. The New World is a film of depths and degrees. Its title is apt, but too humble: there are worlds in it. It’s a shame when a film that always feels like it’s beginning comes to its end, but Pocahantas’s real-world narrative demands The New World’s quick conclusion. Yet we have the film’s staggering grace note to grab hold of. Pocahantas to Smith: “Did you find your Indies, John?” His embittered reply, “I think I sailed right past them.” His ambition to be a discoverer of worlds pales in comparison to her desire to love and be loved. Thankfully, Terrence Malick’s vision isn’t as narrow as Smith’s.